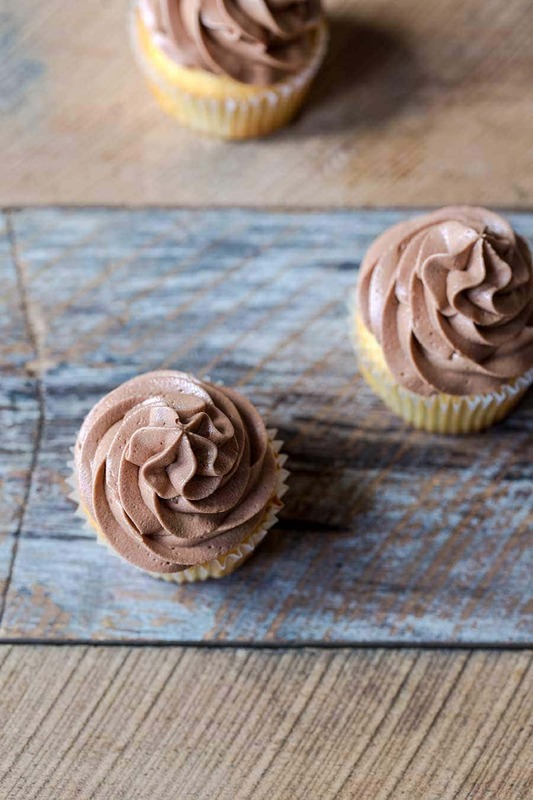 These classic vanilla cupcakes are topped with a light, fluffy chocolate buttercream. They’re super moist, delicately sweet and perfect for every occasion. 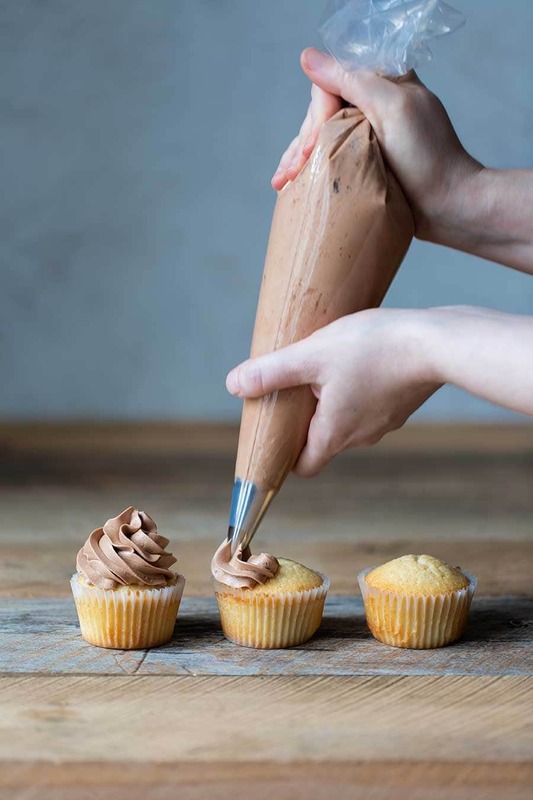 I’ve included a slew of cupcake baking tips and frosting tips to get you going. 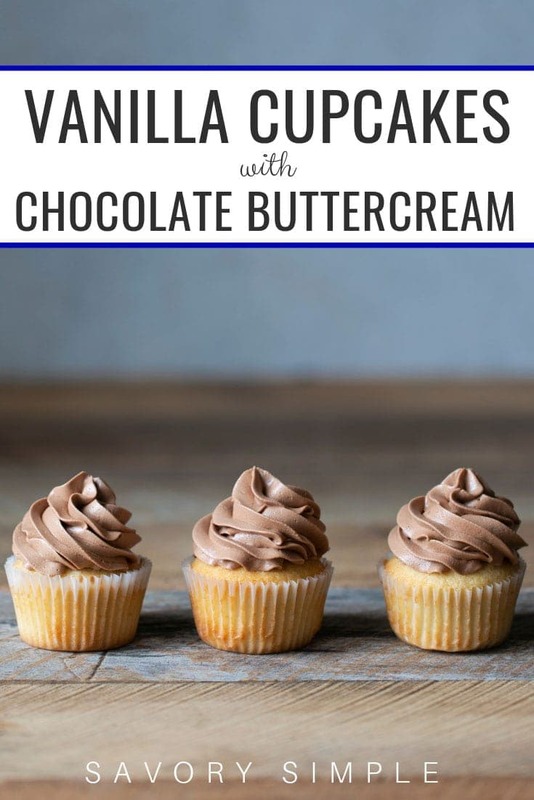 Try this vanilla cupcake recipe; you’ll be glad you did! 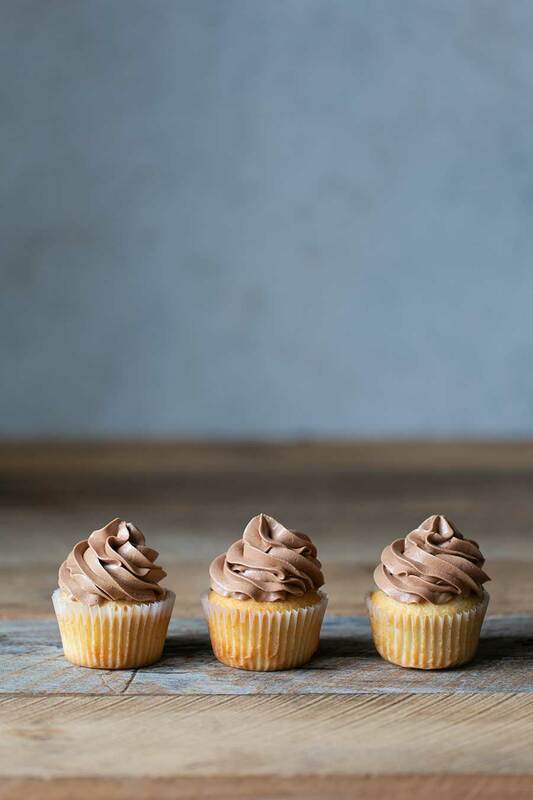 I love experimenting with new and unique desserts, but sometimes there’s nothing better than simple, classic treats like these vanilla cupcakes with chocolate buttercream. They’re sweet (but not too sweet), delicate yet sturdy, and comforting like a warm fuzzy blanket. Let’s get to it! I have baking tips galore. As much as it may be tempting to fill the liners all the way, I recommend filling them only halfway. Cupcakes don’t need big muffin tops; frosting will add plenty of height. If you don’t want to use liners, you can spray the pan with baking spray or grease with a bit of shortening/butter. I recommend using liners to prevent the cupcakes from drying out. Don’t open the oven door while the cupcakes are baking. This will lower the oven temperature and lead to uneven baking, especially since the colder air will all be toward the front of the oven. It can also cause structural issues if the oven door slams shut before the batter has set. Use the oven light until you’re ready to test with a toothpick. 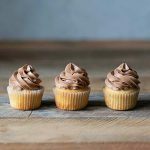 While this vanilla cupcake recipe is easy, the included chocolate buttercream is a bit more advanced. If you’d prefer an easier chocolate frosting recipe, try my sour cream chocolate frosting! It tastes wonderful with these cupcakes. If you want to skip the chocolate, try these with the cream cheese frosting I used on my carrot cupcakes! Those would be amazing. You can bake these up to 48 hours in advance before frosting. I love preparing cupcake recipes over two days when I have the time. You don’t want to frost warm cupcakes or the buttercream will melt and slide right off. So instead of waiting for them to cool, I like baking them the night before and then frosting the next day. I used a Wilton 1M Open Star Tip to frost these cupcakes. This is one of my favorite piping tips when I want to create a swirly star effect. The Ateco 808 Large Round Tip is a good alternative if you want a more simple swirl like you’ll see in my pumpkin spiced cupcakes. I use disposable piping bags, but you can also purchase reusable ones that are more environmentally friendly. You can practice on the kitchen counter or a plate before piping frosting onto the cupcakes. It’s easy to scoop the frosting back into the bag, so why not work on your technique first? As I noted above, you don’t want to frost warm cupcakes because the frosting will begin to melt and slide right off. Make sure your cupcakes are room temperature (they can also be frosted while cold). Can Vanilla Cupcakes Be Frozen? You can freeze these cupcakes before frosting them, but I’d recommend skipping the liners to be safe. Professional grade liners should be ok, but less expensive liners could potentially get stuck. 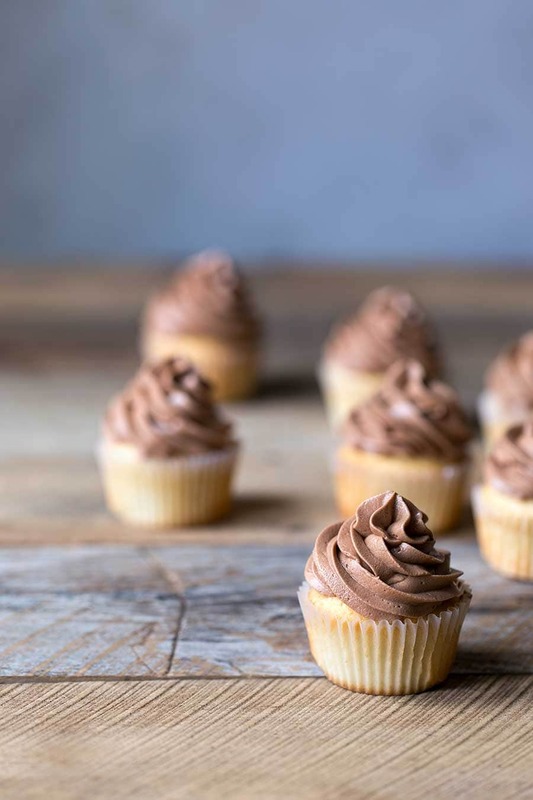 To freeze the cupcakes, let them cool to room temperature completely, then wrap individually in plastic wrap and place in a freezer bag for up to 3 months. Can This Vanilla Cupcake Recipe Be Turned Into a Cake Recipe? Yes! In fact, I’ve done the math for you already, because these cupcakes are adapted from my white cake recipe. It yields two 8-inch round cakes. Can All-Purpose Flour Be Used Instead of Cake Flour? I recommend using cake flour with these cupcakes for best results. If you don’t want to buy cake flour, I have good news! You can make homemade cake flour using all-purpose flour and cornstarch. Learn how in my tutorial: How to Make Cake Flour, Bread Flour, and Self-Rising Flour. If you like this vanilla cupcake recipe, you should also check out my Dark Chocolate Cupcakes, Carrot Cupcakes, and Peach Bourbon Cupcakes! I also love these Ice Cream Cone Cupcakes from Baking a Moment. These vanilla cupcakes are going to be your new favorite dessert! Moist, delicate, and just the right level of sweetness. I’ve paired them with a chocolate buttercream. Place oven racks on the upper and lower third shelves, then preheat the oven to 350 degrees F. Line three standard cupcake pans with 30 liners and spray lightly with baking spray. Note that one of the pans will have 6 empty spots. I recommend spraying from above with your arm at a distance to keep the spray from sending the liners flying. If you don’t have enough pans or you have an older oven that doesn’t cook evenly, these can be baked in batches. In a medium-sized bowl, whisk together the flour, baking powder, and salt. In a separate medium-sized bowl, vigorously whisk the egg whites until frothy, 15-20 seconds. Whisk in the half-and-half and vanilla until evenly combined. In a stand mixer fitted with the paddle attachment, cream the butter and sugar on low speed for 3-4 minutes, until the mixture has lightened in color and fluffed up slightly. Scrape down the sides of the bowl using a spatula. Turn the speed to low and swiftly alternate between adding the dry and wet ingredients over 50-60 seconds, beginning and ending with the dry ingredients. Scrape down the sides of the bowl all the way to the bottom to catch hidden dry patches, then turn the speed to medium for 20-30 seconds to aerate the batter. Divide the batter between the cupcake liners. Don’t fill the liners more than halfway up (when in doubt, less is more). Level the tops out (I like using a small offset spatula to do this). Bake for 25 minutes, or until the edges are golden brown, the tops are still slightly pale but firm, and a toothpick comes out clean from the center. Let cool for 5 minutes, then carefully transfer to a wire rack to finish cooling (I use an offset spatula or butter knife to lift them out of the pan). Cool completely to room temperature before frosting. Place the egg whites in a stand mixer fitted the paddle attachment and turn the speed to medium-low. Add the sugar, water and corn syrup (if using) to a medium-sized saucepan without stirring. Cover and turn the heat to medium-high. Once the liquid begins to simmer and steam develops, remove the cover. Attach a digital thermometer to the pan and cook the sugar to the soft-boil stage, 235-240 degrees F. While the sugar syrup is coming to temperature, turn the stand mixer speed to medium-high so the egg whites can form a soft peak. Turn the mixer speed down to medium-low and slowly pour the syrup down the side of the bowl into the eggs. Don’t pour the hot syrup directly into the meringue or you’ll have scrambled egg whites. Once the syrup is incorporated, turn the speed to high and allow the meringue to continue to form a stiff peak while cooling down. Mix on high until the meringue has reached room temperature, around 20 minutes. Once the meringue reaches room temperature, slowly begin incorporating the soft butter on medium speed. Once all of the butter has been incorporated, turn the mixer speed up to high and slowly add the vanilla, chocolate, and food coloring, if using. Fill a piping bag halfway with buttercream, (I used a Wilton 1M tip), twist to close, and pipe decoratively. Serve cupcakes at room temperature. Store at room temperature, preferably in an airtight container (they can also be refrigerated, but bring them back to room temperature before serving). These are best enjoyed within 72 hours. If you don’t have enough cupcake pans, these can be baked in batches. Make-Ahead: You can prepare the cupcakes and/or the buttercream up to 48 hours in advance. I usually make the cupcakes at least a day in advance so I don’t have to wait for them to cool before frosting. Store the cupcakes at room temperature (you can loosely cover them with a clean dish towel, but they’ll stay moist on their own). Store the buttercream in an airtight container in the refrigerator, then bring to room temperature before using. Briefly whisk or place back in the stand mixer with the whisk attachment to make sure it’s nice and fluffy before frosting. I recommend leaving the butter out overnight if you have the time. Corn syrup is optional; it helps prevent the sugar syrup from crystallizing. If meringue buttercream breaks, it can always be fixed! It simply means the butter and meringue are different temperatures. More on how to fix it here. I typically melt small quantities of chocolate in the microwave. Coarsely chop the chocolate and place in a small microwave-safe bowl. Microwave in 15-20 second increments, stirring each time, until the chocolate is smooth and shiny. Cool to room temperature, stirring periodically. You’ve done it again! These are incredible! You’re right! This classic recipe is one of my favorites! Love it!! This is one of my favorites! Thank you! !